In terms of strategy & consulting we are your experts! Benefit from our long-standing expertise in the field of digital media. Together we address your problem, analyse markets, competitors and market drivers. We derive specific recommendations for action and concepts for your needs. At the beginning of a collaboration we start with an analysis of the current situation and thus capture the status quo of your brand in the digital web. For this we create competitive comparisons, access online conversations, define benchmarks and identify relevant channels for content distribution or marketing. We oppose the status quo with the vision and develop a strategy from it. This is deposited with sub-targets, all of which are deposited on the overall objective of the company. We always define goals according to the smart principle and determine KPIs for all of them, whereby each sub-target can be tracked transparently. 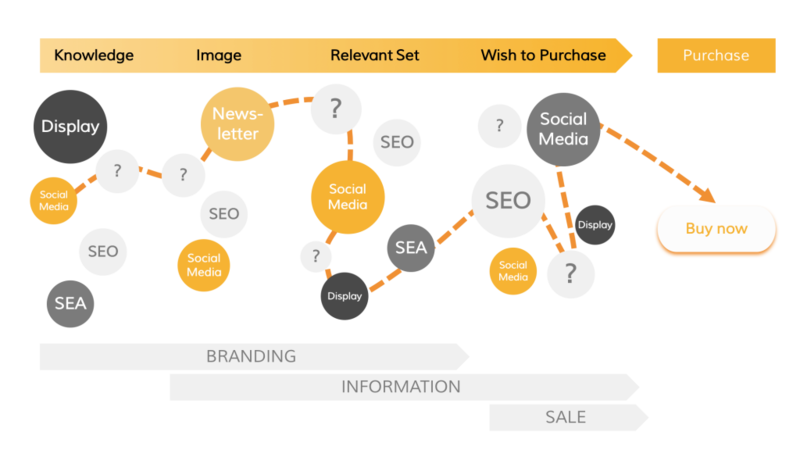 In the digital age, customer journeys become more complex but also more measurable. Together with our customers we discover the different phases and touch points that a potential customer is going through until the purchase. Which channels are relevant for our customers? How can we influence these channels? How do we have to communicate with the target audience at every stage in order to move them to the desired action? Who is the potential follower? What is their motivation to connect with us? What does a follower expect from us? What goals can we achieve with social media? We ask these questions when creating a social media strategy. We define target groups in cooperation with our customers, channels, tone of voice, themes and formats in order to achieve our goals. Working with key figures (KPIs) enables us to assess success. Each brand is different, so we customize each strategy to meet the needs of our customers.